Using thermal imagery, researchers can now see what lies beneath the dirt-covered desert landscape. A team of researchers from the University of North Florida and the University of Arkansas have successfully used drones to unearth a 1,000-year-old village in northwestern New Mexico, revealing never-seen-before structures, unique insight into who lived there and what the area was like. Dr. John Kantner, a UNF associate professor of anthropology and an assistant vice president of research, and Dr. Jesse Casana, an archaeologist at the University of Arkansas, teamed up last summer to test the drones in a remote area of northwestern New Mexico. The research results were published in the May issue of the Journal of Archaeological Science. The archaeologists used an advanced drone that was programmed to fly a precise, GPS-guided path, with the thermal camera systematically imaging the ground surface. Images captured by the airborne camera were then processed using specialized software that transforms hundreds of individual photos into an accurate “heat map” of the ground. 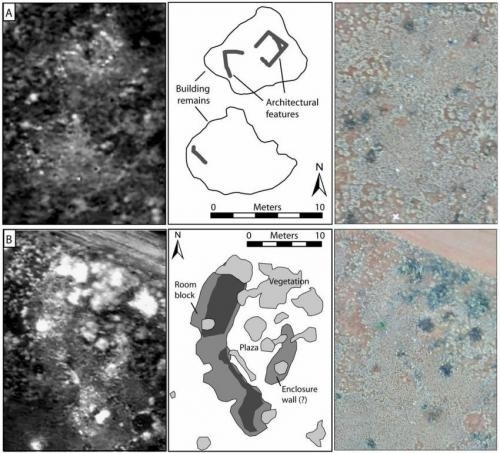 “The drone with its thermal camera was able to not only pinpoint buried masonry architecture that I didn’t know about, but it also identified a number of circular “cool” signals that are the perfect shape and size to be kivas, ceremonial structures where people would meet for worship and decision-making,” said Kantner, who noted it was one of the most interesting discoveries. With funding from the National Science Foundation, Kantner has studied the landscape south of Chaco Canyon for decades. He said he always knew there were homes from Pueblo ancestors in the area now called “Blue J,” but the ruins have been obscured by vegetation and buried in eroded sandstone. He’s particularly interested in how this powerful religious phenomenon impacted local social and political dynamics. “To determine this from ancient remains requires that I know exactly where houses and religious buildings were located and what they looked like, and this is where the challenge lies, because many of them are buried below the surface. It’s all but impossible to find ruins covered with dirt and vegetation unless you systematically and painstakingly excavate test pits to find them, and this takes forever,” Kantner said. Archaeologists have known for decades that aerial images of thermal infrared wavelengths of light could be a powerful tool for spotting cultural remains on the ground, but the technology just wasn’t feasible. The team is working on refining its methods and plans to use thermal imagery for research in other parts of the world, with the goal of making aerial thermography a routinely used method for uncovering the human past.